There are quite a few reasons why sit-on-top kayaks (SOT kayaks) have become so popular of late. First off, they provide you with a great and wide view. Besides that, some experts agree that these yaks tend to provide a better sitting position for those with low back pain e.g. tight hamstring muscles. Another thing is that SOTs do not restrict movement. They don’t cover the paddler’s legs either meaning they’re perfect for divers, swimmers, and fishermen. Do you have a large body? 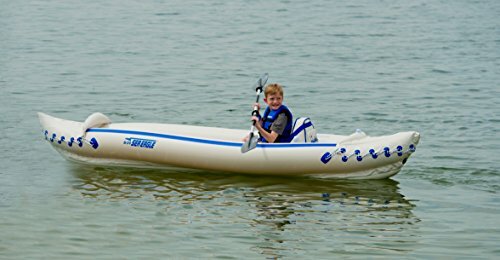 Well, people with larger-than-average body types may struggle to fit inside the cockpit of a sit-in kayak. That, however, isn’t the case with SOT watercraft. With so many benefits to their name, these types of kayaks present you with a wide raft of opportunities – but only if you find the right one. Let us take a closer look at some of the alternatives available at your disposal. First off, here’s a detailed table meant to help you make an informed bet. Ultimately, our goal is to help you make an informed spending the least time on research possible. Whether you prefer paddling solo or with a friend, this two-person kayak can be a good investment. It comes with everything you might need for use right out of the box. Featuring a 440-pound weight capacity, the boat is nimble enough to support a solo paddler. In addition, it is sturdy enough for two adults. With a 34-inch beam, the boat has great stability to keep you balanced even when the water or wind acts up. Thanks to its impressive stability, making the perfect cast while standing up should also not be a problem. As if that’s not enough, it comes equipped with three fishing rod holders and four flush-mount rod holders. The rod holders are designed to give you an edge while fishing. On top of that, the boat is outfitted with two paddle rests for hands-free fishing. When it comes to storage, this is yet another area that the kayak does not disappoint. It spots a secure cargo area at the rear that can accommodate large pieces of gear. Besides that, it has two compartments that are waterproof to ensure your valuables stay dry. If you’re on the market for a performance-driven kayak, the Perception Pescador Pro might just be what you need. It is built with fishing enthusiasts in mind and is more suited to light lakes and rivers. Also you need to invest under $1000 to get this kayak. When it comes to storage capacity, this is one area the boat stands out. It has a bow tank well featuring a mesh cover, tackle-box storage, rear tank well, and molded-in rod holders. Also included is a center console for storing fish finder electronics and molded-in cup holders. Moving on, the boat is fitted with a 5-deck stern plate for additional durability. On top of that, it boasts ergonomic carry handles that make transporting the kayak such a breeze. Therefore, you can easily get it on top of your truck as well as to and from the water. 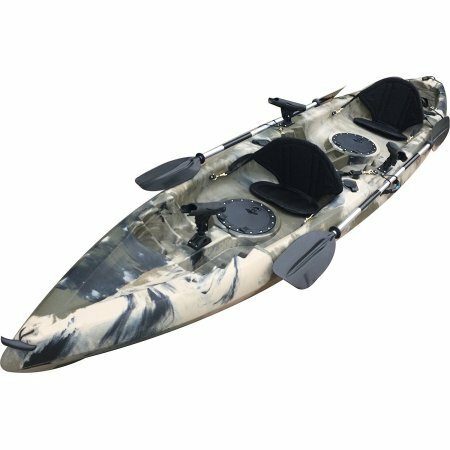 Additionally, the Perception Pescador Pro spots two seating positions featuring adjustable stadium-style design. The seat is also removable and can be used in upright or recline positions for maximum comfort. Sun Dolphin is one of the most preferred kayak brands and with their Journey 10-Foot Kayak, it is easy to see why. At 10-feet long, the boat definitely has plenty of leg room to accommodate different paddlers. Best of all, it is equipped with adjustable foot braces so you can easily customize it to suit your height. Additionally, the kayak features a padded seat that is adjustable and protective thigh-pads for optimal all-day comfort. Perfect for use on rivers and lakes, the Sun Dolphin Journey paddles and tracks with so much ease. This makes it ideal for both novices and avid kayakers. You know what the best part is? It is constructed from high-density and rugged Fortiflex polyethylene that is UV-stabilized to ensure it lasts for a very long time. More importantly, the boat boasts a large and open cockpit with a storage compartment along with a portable accessory carrier. A shock-cord deck rigging also comes in handy so you can secure your large gear. 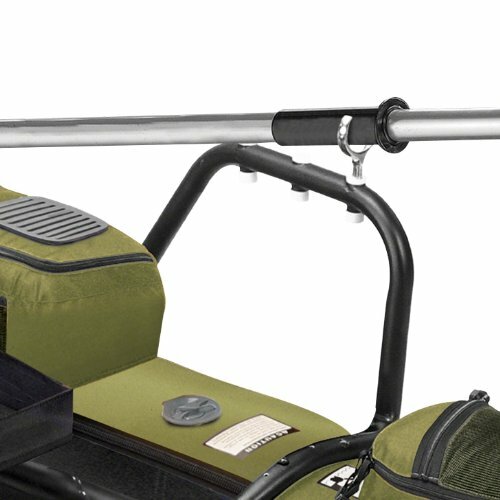 It also includes a swivel rod holder, water bottle holder, and two flush-mount rod holders. This Inflatable Colorado Pontoon is one of the most highly rated Sit-On-Top kayaks on Amazon and for many good reasons. For starters, it’s a favorite for novices and pros alike as it’s able to navigate both lakes and rivers with ease. Equipped with three oar-lock positions, the boat gives the paddles the freedom to choose their preferred mode of operation. It also includes built-in oar rests for added convenience. More importantly, the boat features a padded plastic seat that can be folded down for ease of transportation. The seat along with the footrests are also adjustable to allow for extra comfort especially when fishing all-day. As if that’s not enough, it is outfitted with loads of storage capacity including mesh and zippered pockets. On top of that, it has two drink holders, a foam fly patch, wire storage at the rear, and a battery platform. For maximum durability, the boat is made from heavy-duty materials with the bottom being abrasion-resistant PVC. The tops, on the other hand, are constructed from rugged nylon. At 32 pounds, the Sea Eagle SE370 is extremely portable for use by one person. Thanks to its inflatable design, the boat easily packs down to fit in a carry bag. As far as weight capacity is concerned, it holds up to 650 pounds. Therefore, it can carry at least three people and extra gear with no problems. You can also bring your pet along with you thanks to its rugged hull that can withstand dog claws or paws. In addition, it features an I-beam floor designed to ensure extra rigidity. As such, you can use it in a river or a lake. Also included are two molded kegs that make tracking easy and smooth across the water. On top of that, the kayak spots a self-bailing drain valve which allows for smooth paddling on Whitewater Rivers. Last but not least, the Sea Eagle SE370 boasts a removable inflatable seat at the front and rear with a decent comfort level. Are you on a tight budget and looking for a tandem kayak? This Explorer Inflatable K2 by Intex is an excellent option worth considering. The boat is perfect for smaller bodies of water like rivers and lakes. It is easy to paddle solo thanks to its streamlined design. Moving on, the boat features sporty graphics and a bright yellow color that make it extremely visible in the water. This comes in handy during an emergency. In addition, it is fitted with a removable skeg designed to provide directional stability. Moreover, it is equipped with two adjustable seats along with backrests for optimal comfort. The cockpit is also quite spacious for extra comfort. Additionally, the kayak spots a sturdy and inflatable I-beam floor for rigidity. Extra accessories included with the boat are two aluminum oars and a high-output air pump for quick inflation and deflation. Designed to accommodate up to three people, the kayak also does a great job as a solo boat. Customers who have bought the boat rave about its great comfort level. As it turns out, it features padded backrests coupled with multiple footrest positions. This makes it ideal for paddlers of different sizes. The boat is also very stable with impressive tracking ability thanks to its unique hull design. You, therefore, don’t have to worry about it feeling tippy when fishing while standing. As if that’s not enough, the Lifetime Tandem 10-Foot spots ditty trays together with shock-cord straps for securing loose gear. With a maximum weight capacity of 500 pounds, it can easily accommodate two full-grown adults and extra gear with ease. 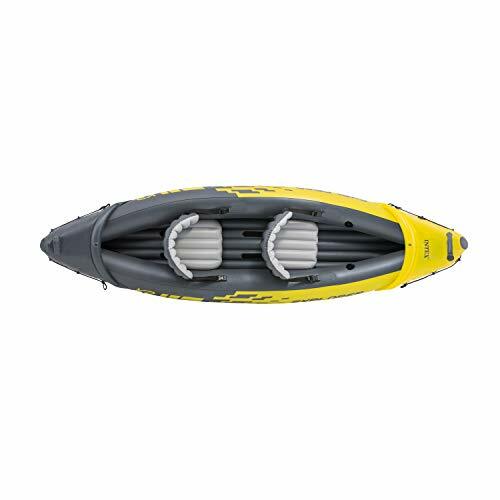 This Malibu 12-Feet Two Tandem is yet another great Sit-On-Top Kayak that managed to earn a spot on the list. One of the reasons is the fact that it is ideal for a wide range of paddlers including children and adults. One negative thing is this kayak is little-bit high pricey. On top of that, it features two Comfort Plus seats but has three seating positions. This makes it perfect for use by two adults along with a small kid or pet. However, you can also choose to paddle it solo from the center seat. Further, the boat is outfitted with overlapping foot wells that provide comfortable foot bracing for the center-seated paddler. For easy on-dock storage, it has a unique hull and deck design which allows you to stack multiple hulls. Another outstanding feature of the kayak is its skid plate designed to ensure extra durability. So, regardless of how hard you are on it, you might not need to buy another boat soon. Also included are molded carry handles for ease of maneuverability. 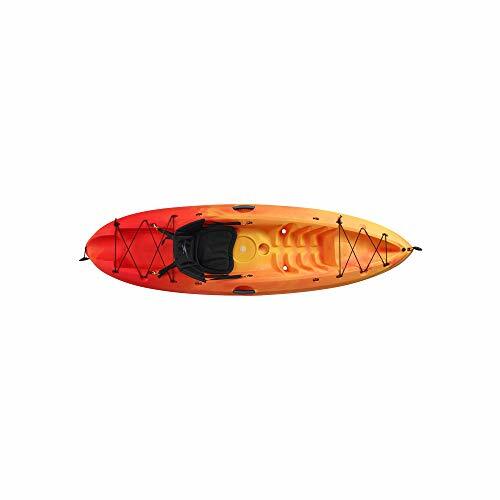 If you like traversing calmer rivers and lakes solo, you should definitely consider this 10-Foot Bali SS kayak. It ships with a portable accessory carrier that you can use as extra storage. There is also a dry compartment along with shock-cord deck rigging to keep your gear secure. 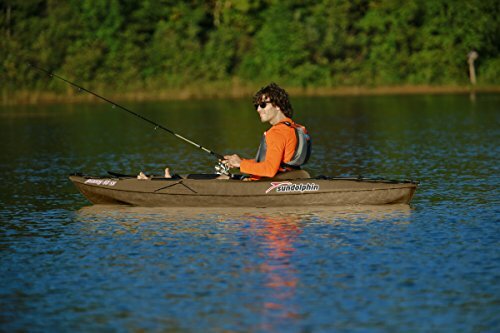 Moreover, the kayak is outfitted with a large seating area featuring protective thigh pads and adjustable foot braces. Therefore, if you’re going to be paddling all day, comfort should not be an issue. As if that’s not enough, the Sun Dolphin 10-Foot Bali SS is made with durability in mind. It is made of rugged Fortiflex polyethylene that is UV-stabilized to ensure long-lasting performance. But probably the best thing about the kayak is that it paddles and tracks with so much ease. Its stability is also very impressive. 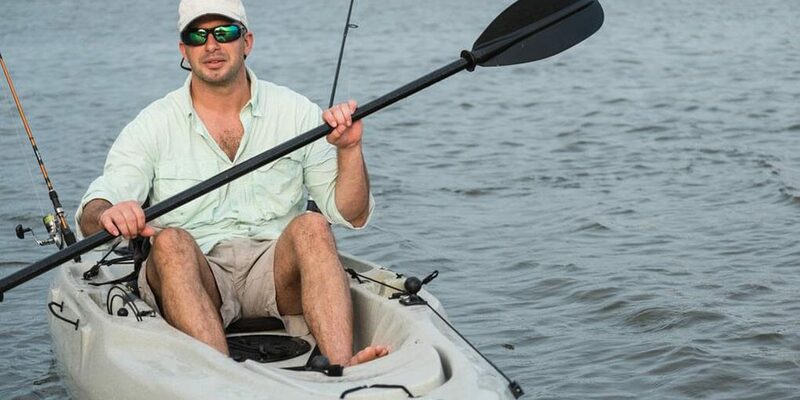 Included with the kayak is a molded-in paddle holder so you can enjoy hands-free fishing. Carrying handles also come in handy for ease of transporting the boat. If you’re looking for a compact kayak that is very responsive, you should check out this Frenzy from Ocean Kayak brand. It’s a one-person boat that’s easy to carry thanks to its molded-in handles on the side plus bow and stern carry handles. When it comes to storage, the kayak spots a stern tank well coupled with bow deck bungees and removable bungees. Therefore, you don’t have to worry about running out of gear space or losing your items while kayaking at high speeds. Additionally, it is fitted with a four-way adjustable seat that supports comfort for any body type. As such, the boat is perfect for those long fishing trips. You know what’s the best part? Well, the Ocean Kayak Frenzy features the brand’s renowned Tri-Form hull design that offers both primary and secondary stability. On top of that, it is equipped with a long keel at the center to keep you paddling straight. This makes it extremely responsive on flat water but a bit playful in the surf. If easy access, better view and a comfortable sitting position are top priorities to you, finding the best SOT yak is of prime importance. Here’s exactly what you need to be on the lookout for so you can make an informed choice. Generally speaking, longer and narrower yaks tend to travel faster than shorter and wider ones. On the other hand, shorter and wider yaks tend to be more stable and ideal for beginners. So, if you’re looking for speed, we’d suggest going for the former. But if you’re just starting out and you’d like to learn the skill in a stable yak, then the latter choice would be your best bet. Will you paddle alone, with your pet or spouse? If you’re a solo rider, then it makes perfect sense to invest in a solo kayak. Tow person kayaks are ideal for both solo situations and when you’re accompanied by your spouse. Want to bring your friends along? You could consider going for quad or triple kayaks. You either consider renting those if they’re for temporary use or buying them for long-term use. Ultimately, you don’t want to end up with a yak that’s too big to paddle most of the time. The most common size is the tandem sit-on-top kayak – recommended for expeditions of two. 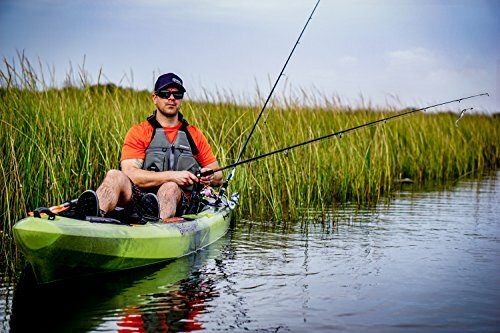 Your style of fishing can determine the kind of kayak you invest in. If you’re looking for an action-packed fishing experience, we’d suggest settling for something suited for that purposes. Kayaks made for whitewater rivers are particularly great when it comes to exploration and adventure. Remember, no single kayak can do everything. The hull of your kayak can determine things like its speed and stability in the water. Generally, there are four common kinds of hulls for kayaks. These are as follows. California Hull: This kind of hull is known for its ability to provide great stability and speed. This combination comes in handy when one is looking for awesome performance in tracking. Chine: There are soft, hard, and multi-chine hulls. The soft chine gives the yak a cylindrical shape which is ideal for faster speeds. The hard chine is almost boxy and comes in handy when stability is needed while multi-chine sits somewhere in between the two. Fishform: Just as its name suggests, this is an asymmetrical hull meant for the waters. 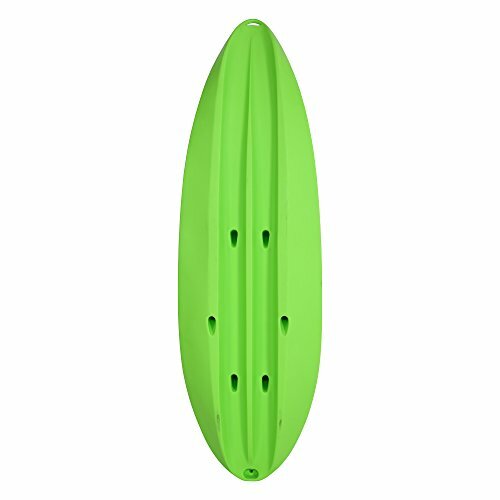 Its unique shape makes it ideal for use in surf zones as well as in waves and swells. Flat Hull: Lastly, the flat hull kayaks are known for being stable. They’re recommended for beginners or anyone looking for a slow but sure ride. It’s not always wise to go for the most stable, look for something in the mid-range, it’ll give you the best chance to learn. This depends on your preferred style of riding as explained in the sit on top kayak buying guide above. Planning to carry heavy loads? Be sure to pay attention to the weight capacity of your kayak. Again we have discussed issues to do with the hull, width, and length of the boat and how it can affect performance. Generally speaking, longer kayaks tend to be faster than shorter ones. Shorter ones, on the other hand, are known to be more maneuverable. Wider kayaks are reputed for being incredibly stable. 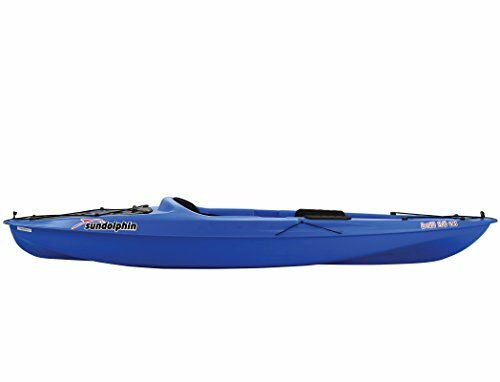 The Sun Dolphin Journey 10-Foot kayak is what in our opinion qualifies as a leading sit-on-top kayak. It has a carrying capacity of one person, though. Its weight limit is also quite limited at 250 pounds. That notwithstanding, we feel that it’s the best choice for solo trips. It has a comfortable area to sit on, dry storage and generally an advanced cockpit. We, therefore, find that it provides the best value for money, overall. Looking for a kayak that can carry a few more people? We’d vouch for the BKC UH-TK181 12-Foot SOT Kayak. It’s built for two users and has plenty of dry storage as well. Fishing on a kayak is interesting and fulfilling. But when you’re far from home and planning to fish in rough conditions, it’s always best to settle for the best fishing gear. We take this opportunity to wish you nothing but the best in all your choices – happy paddling.